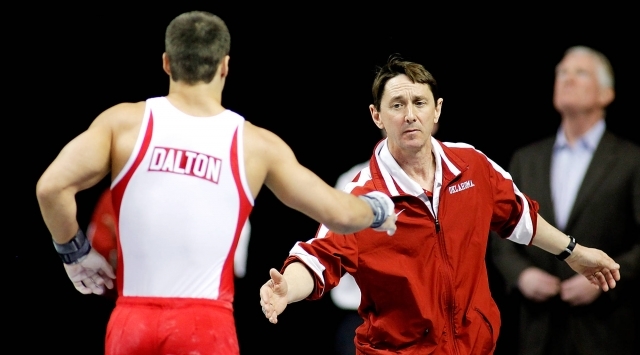 Oklahoma men’s gymnastics coach Mark Williams was named the MPSF Coach of the Year for the 12th time in his 17-year career, and the second year in a row, the conference announced Monday. Williams guided his team to its fifth straight MPSF Conference title over the weekend. The Sooners notched an MPSF Championship-record 448.050, which included an NCAA-record 77.000 on parallel bars, to claim the crown. Oklahoma has won the MPSF championship in 14 of Williams’ 17 season at the helm for OU. In addition to the team title, three Sooners took home individual conference titles. Junior Allan Bower won the all-around with a score of 90.100, freshman Yul Moldauer took parallel bars with a 2016 NCAA-best 16.100 and senior Kanji Oyama grabbed his third straight title on vault, scoring 15.400. The Sooners started the year ranked No. 1 in the Collegiate Gymnastics Association’s preseason poll and have retained the top spot for the duration of the season. In 2016 Williams has led OU to a second consecutive unbeaten regular season and the Sooners have twice topped the 450-point mark. Oklahoma is still the only team in NCAA history to accomplish that feat, having also done so three times in 2015. Oklahoma enters the 2016 NCAA Championships seeking to defend its 2015 title and claim its fourth set of back-to-back titles and its third under Williams. A potential national championship would be the seventh of Williams’ career and the 10th in program history for OU. The Sooners currently rank first nationally in team 4-score average and in every event apart from pommel horse. As a team Oklahoma has won 48 of the possible 54 event titles in its nine meets so far in 2016. Additionally, Sooners have won 52 of the possible 63 individual events titles (including the all-around) this season.